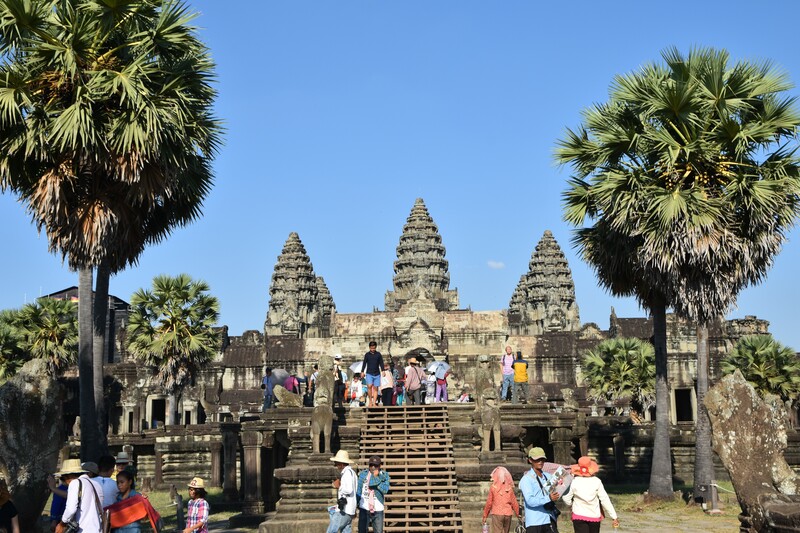 Why to visit Angkor Wat | About various things! 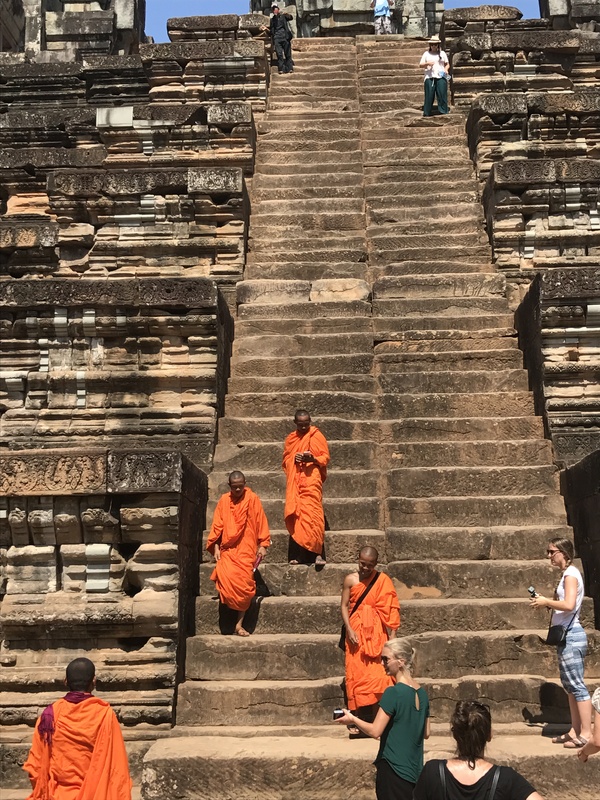 When I included Cambodia on the list of destinations I would like to visit, I did not think that this country would surprise me so much and that it would leave a fingerprint that cannot be matched in my heart. 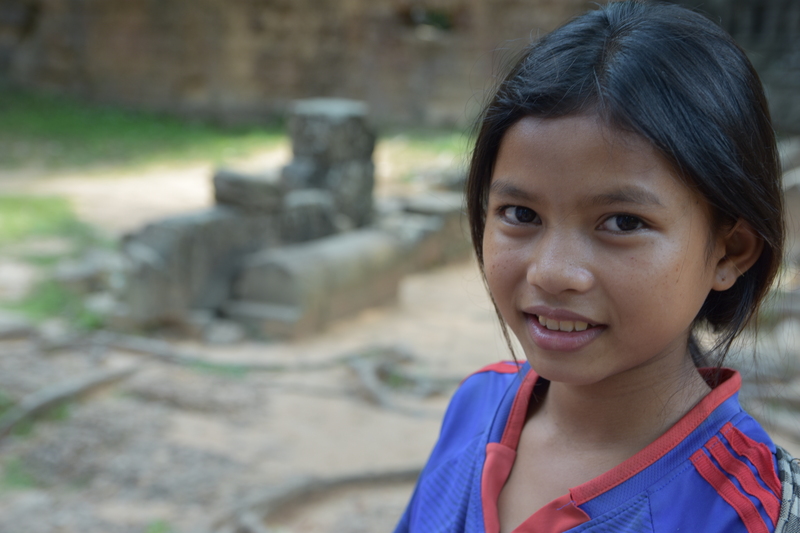 I knew about the Cambodian people that they had some rough times, that it had gone through an unimaginable genocide during the Khmer Rouge, from which the country did not fully recover. 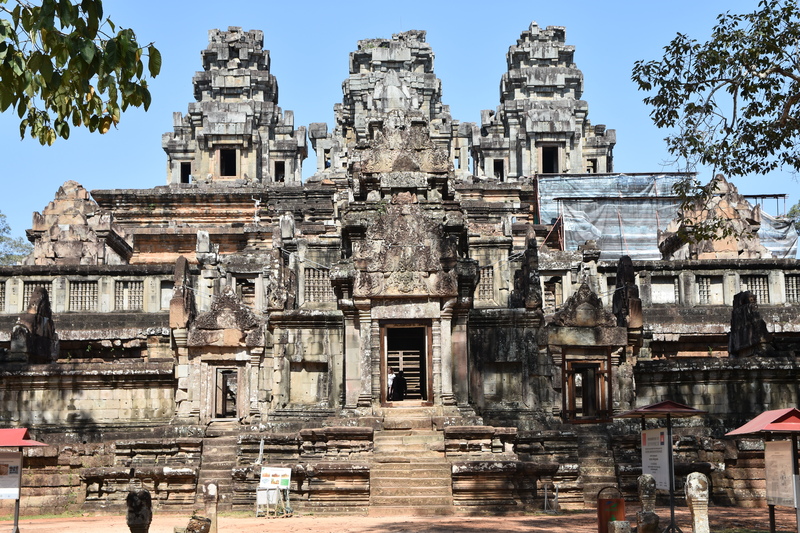 Also, I knew that they owned the most important archaeological park in South East Asia, a proof of the existence of an absolutely amazing civilization – Angkor – that stretches over an area of ​​about 400 square kilometers in the Cambodian jungle and contains over 1,000 temples. 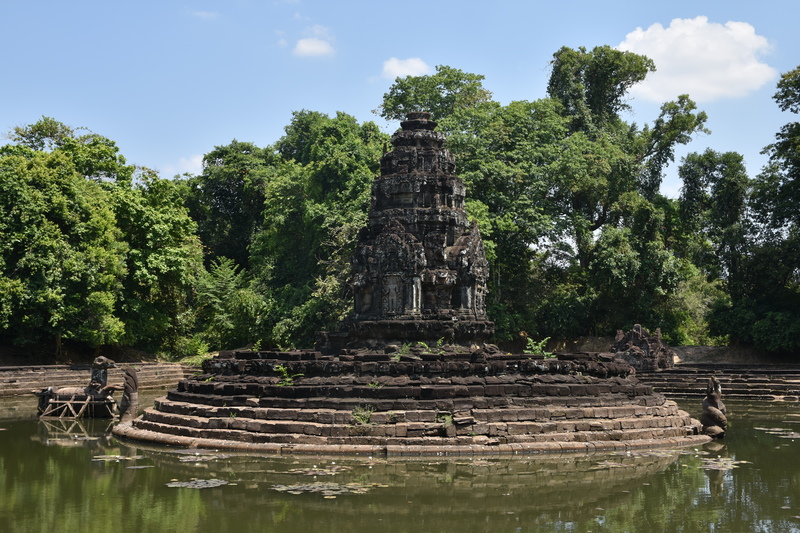 Former capital of the Khmer Empire, the temple complex is in the heart of the Cambodian jungle and is the largest UNESCO-listed religious monument in the world. 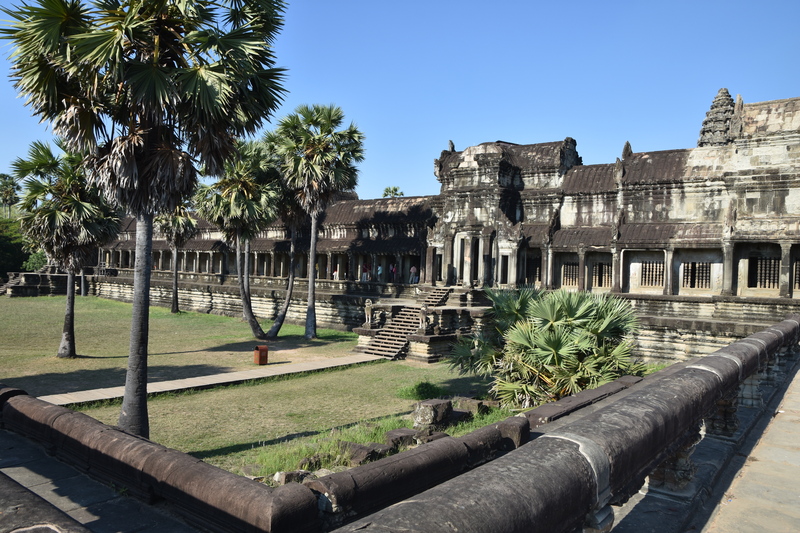 We also knew that Angkor Wat is the most important and most visited temple of all that is part of the great complex of Angkor. 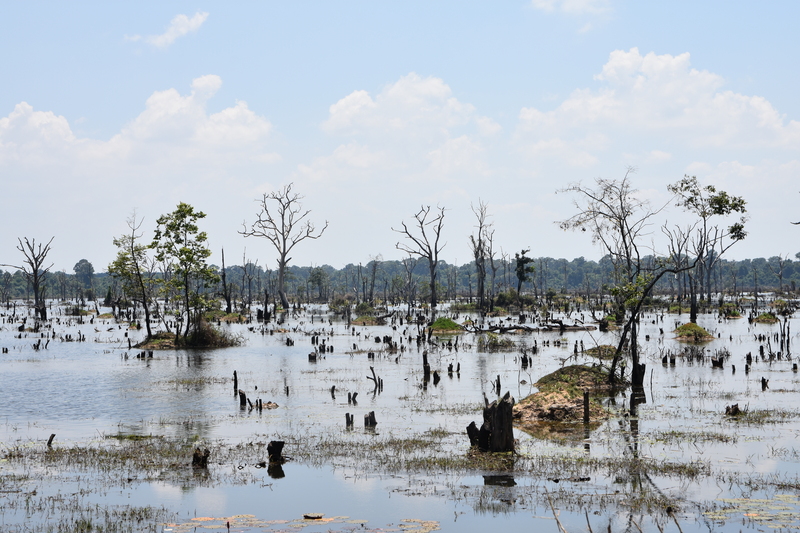 And that was all we knew about Cambodia, but the reality there was a lot different. Here we were, landed at Siem Reap airport, the city closest to the Angkor complex, 5.5 km away. A modern airport was our gateway to a totally unknown world. Quite promptly, the tuk-tuk driver of the Blossoming Romduol Lodge hotel where we booked picked up our luggage and introduced us into Cambodian reality through hidden streets with reddish and dusty roads. I have made the reservations and took care that the villa where we will stay for 3 days would have a swimming pool. I knew the location is very close to Pub Street and that Dan was very excited about this detail. 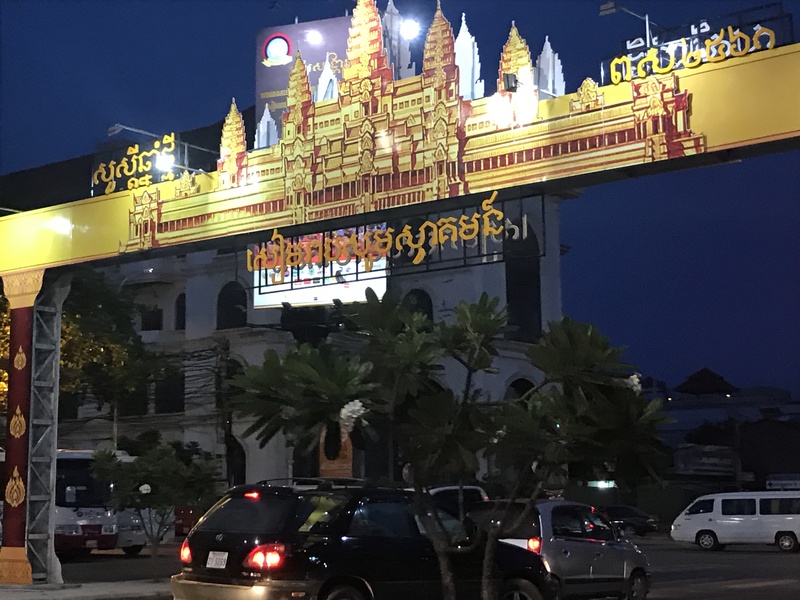 It was night and at the entrance of the city we were welcomed by a emblem of Siem Reap city. As we approached the area we were in, from the tuk-tuk we admired an indescribable bustle, and we knew that we are near the night market and the main place of entertainment in this city. 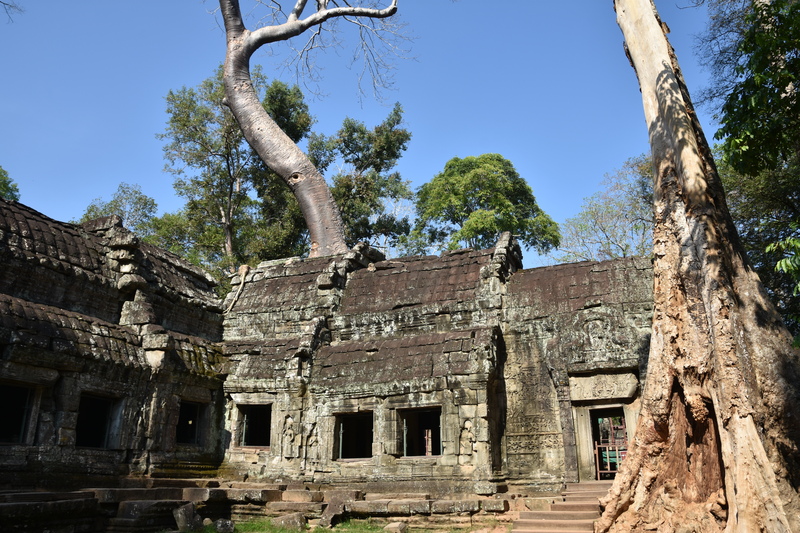 But we were leaving and leaving behind the deafening music, the disoriented and euphoric tourists, as well as the khmer-style appetizing aromas. When the driver turned to us smiling and told us that we had arrived at the destination, I looked discreetly at Dan, and for a few seconds I saw his disappointment: we were in a quiet and dark street, in front of a hostel that did not inspired us. Then I promised myself that in the future I will no longer deal with reservations. 5 minutes later we realized that we were in a beautiful place, that the pool was very clean, surrounded by a mini-jungle and that although we were not right in the heart of the city’s fun, we had a restaurant where we could relax until late at night. I had booked a tuk tuk driver for 50 UDS for two days and set up our visit to the famous archaeological complex since planning the trip back home. Because we wanted to see how the sun rises to Angkor What, a very important tourist attraction, the next day we woke up at 4am, met with our English-speaking driver and a good connoisseur of his country’s history, and we went to Angkor. The first stop was where we bought the tickets that provided us with access to any temple in the area. 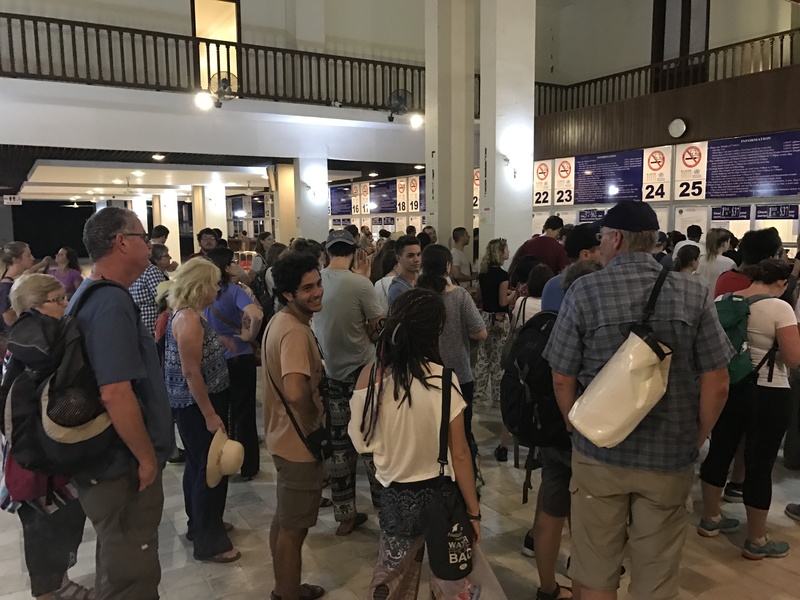 The price of $ 37, not to be neglected, does not keep aside the hundreds of endless queues of tourists from the early hours in the morning. I could not believe that at five o’clock in the morning, the large room where the ticket houses were located was full of people. With the access passes in the hand, up in the tuk-tuk that was deep in the jungle, we started one of the most beautiful adventures we have ever experienced. Moving alongside with some monkeys that roamed at the edge of the forest, we reached the entrance to Angkor Wat. It was, in fact, a parking lot full of tuk-tuks – empty ones! A sign that other tourists were quicker than us. Everything is extremely well organized, starting with drivers that show you exactly where they will be waiting for you and the signs that guide you everywhere. We bought ourselves cold coffee, and because we did not want to lose the moment when the sun was just sunlit in the lake in front of the temple, we accelerated the steps of the journey, because the distances from the place where the tuk-tuk leaves you and to temples are quite large. We have arrived at the place where hundreds of equally early risers tourists waited to immortalize the appearance of the sun and we gently slid through the crowd to catch a spot as far as possible. The view was spectacular, even if the temple was only seen as a silhouette – it’s hard to describe in words – but it’s worth waking up at 4am. 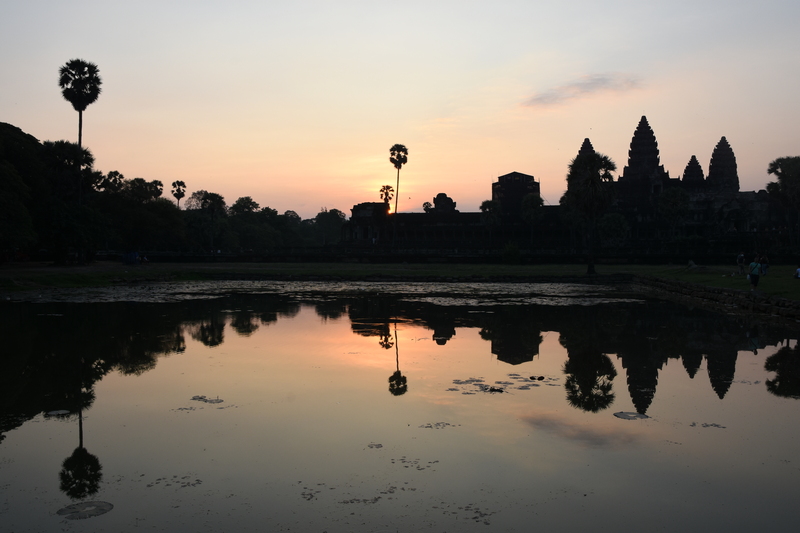 Our driver had asked us that as soon as we see the sunrise, we will return to him because we will go to visit other temples before they are crowded, and here we will come back later. So we went back to the place where he was waiting for us, and a little girl selling souvenirs drew my attention on our way. 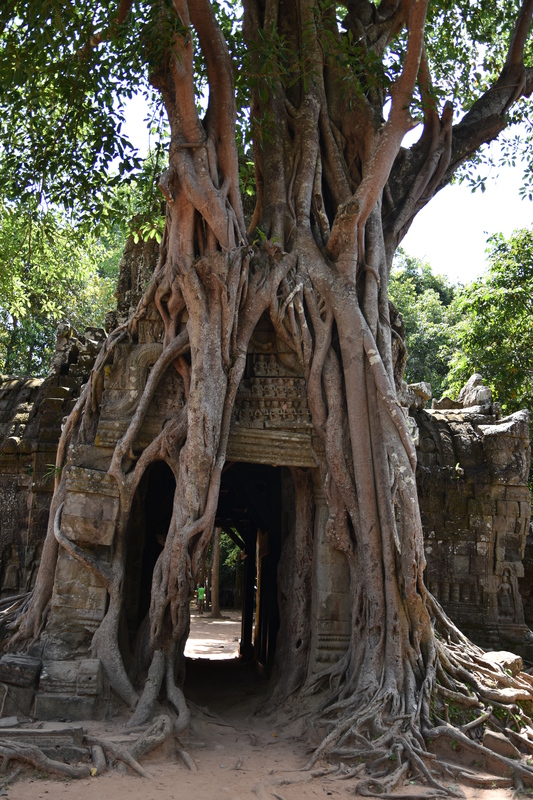 We went on a crazy ride on the jungle roads to Ta Prohm Temple. At one point the guide stopped the tuk-tuk and told us that we would walk from here because he knows another entrance to the inner courtyard of the temple and we will get to see without being disturbed by other tourists , the most visited place here, the ruins where Angelina Jolie shot “Lara Croft: Tomb Rider“. 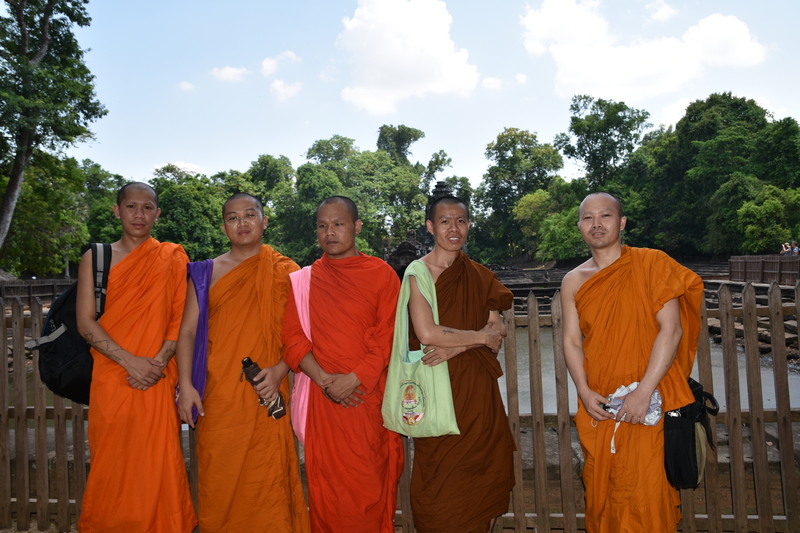 So, accompanied by our guide and the sounds of the jungle, a bit scared, we got to the temple. The driver left us alone and said he will be waiting for us on another entrance. It was just us! Superb! 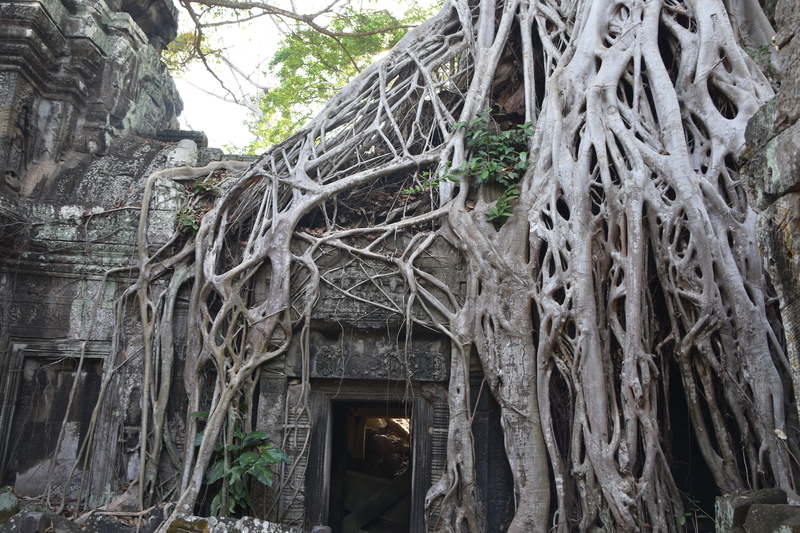 Well preserved buildings and trees of different shapes, with roots passing through walls and covering them entirely captivated us and we did not know when the time passed. 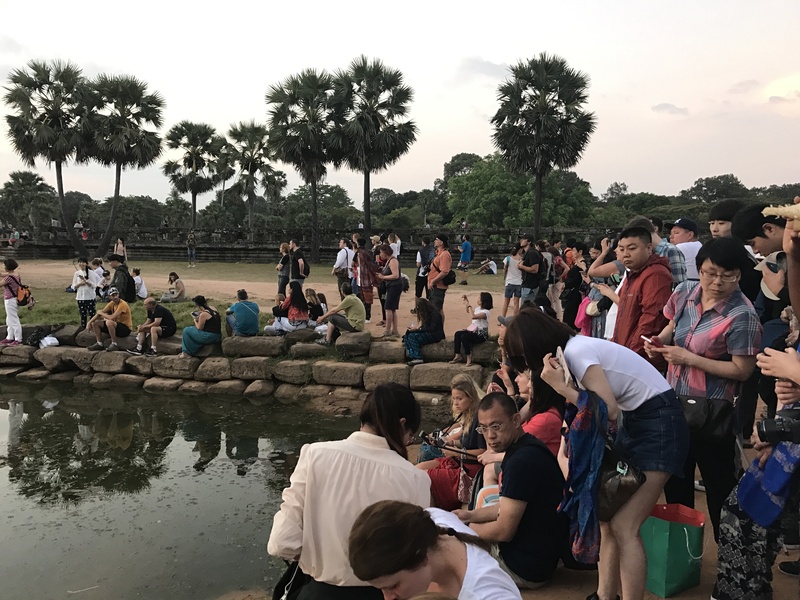 When we finally got to the scene where the famous scene was filmed, the hordes of noisy Chinese people who were drawing attention and sitting in front of you without caring that you were there and took a picture had begun to arrive. The place is unique in the world, I do not exaggerate at all when I say it is almost unreal, here you can see the past, present and future in one place, my words are powerless so I will let the photos speak. A very beautiful and complete article about the history of this superb complex can be found here. 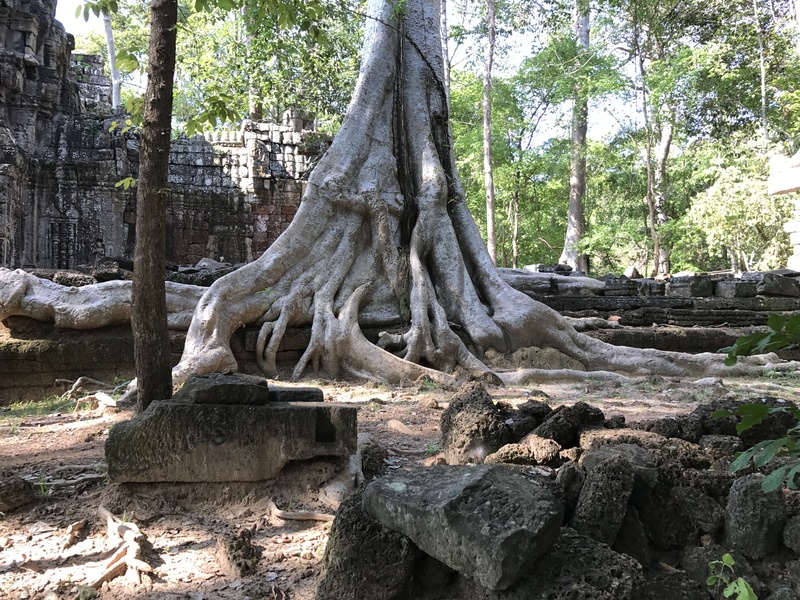 On our way to tuk-tuk we have passed other ancient constructions, some restored, others fenced, sign that there are still archaeological excavations made to bring to light other vestiges that have not yet been discovered. 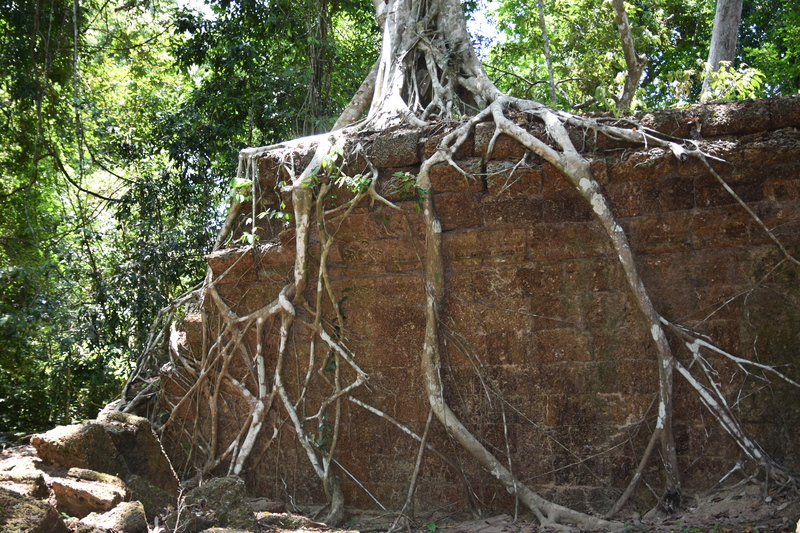 The next temple we came to was Ta Nei, smaller, in the heart of the jungle and where we were the only tourists. 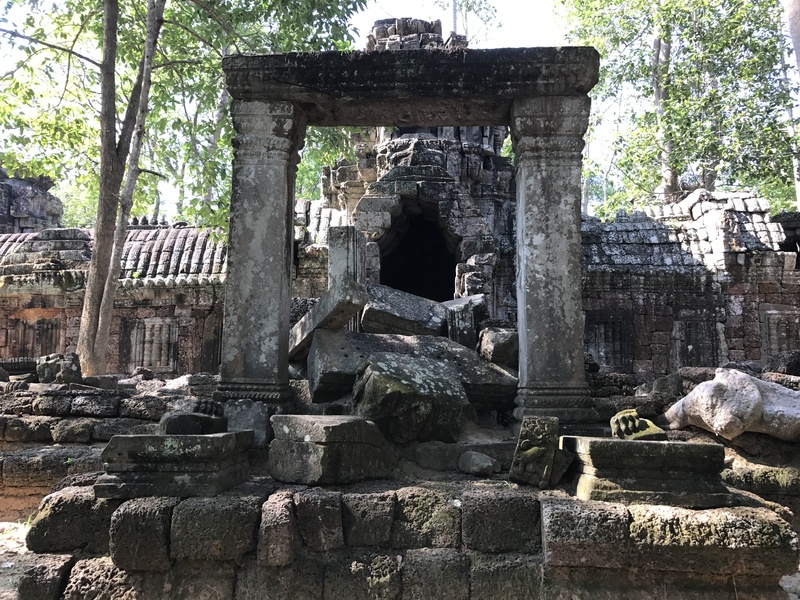 We continued the route recommended by our Cambodian guide and stopped at Ta Keo Temple, a mountain temple that is said to have been struck by lightning during construction and has not been completed. Accompanied by our guide who began to tell us about the life he lived after his wife left for another man who had more money, absorbed in the sad story, we walked through the jungle about 1 km on foot to Preah Khan, a temple almost swallowed by the jungle, which has many rooms with whole blocks of collapsed stone and the roots of the huge trees among them. Through a wider window I went out into an inner courtyard where I saw the most beautiful trees with large roots and trunks that looked carved. Superb! The next destination was Neak Pean, a small temple in the middle of a lake where some Buddhist monks asked us to take a picture and I did not miss the opportunity to do one for me. They were very friendly and amused themselves with us. It was already very hot, my feet were no longer responding, and there were three more places to visit and I did not want to miss them. So I went to Ta Som Temple, an equally beautiful temple, invaded by the jungle trees. 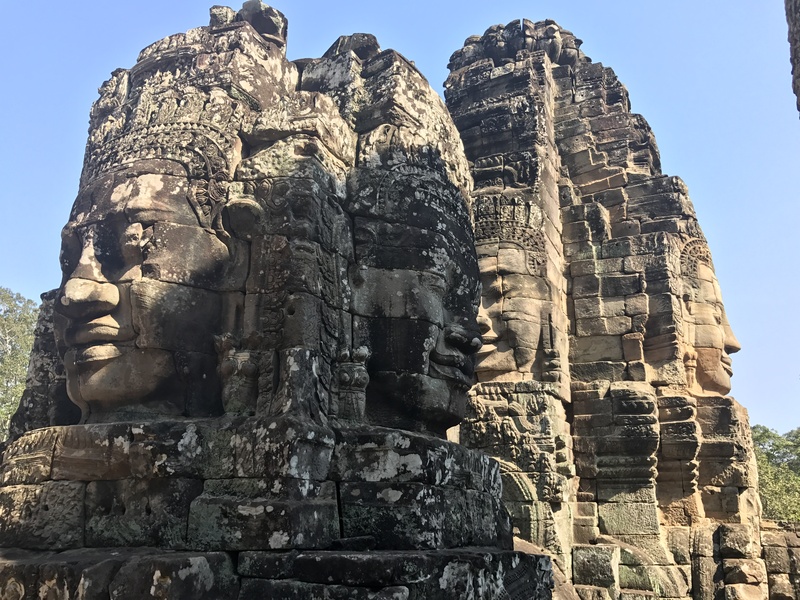 The penultimate most fascinating temple I went to was Bayon, a very sought-after place due to over 200 faces carved in stone towers over 4 meters. You can not remain careless in front of such miracles and get really emotional when you admire their greatness. 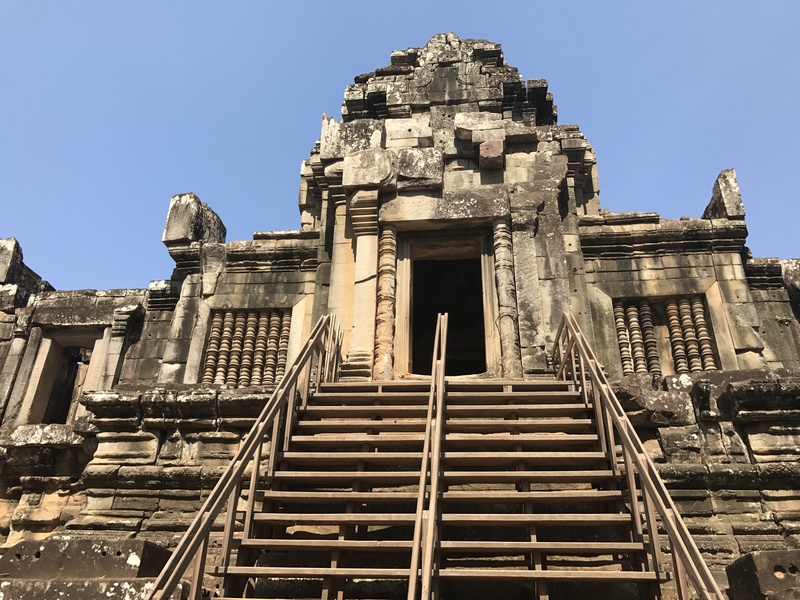 With the last powers remaining we returned to Angkor Wat, where in the morning we admired the magnificent sunrise, but this time we visited a part of the temple, because it is very large. It was a day when I worshiped Architecture, History, with its beautiful side, the Jungle, Nature, as a whole, and Man – who built wonders. We got to the bedded room with numb feet, wet clothes from the 40 degrees outside, we threw ourselves into the pool, then we did a massage right there on the sun loungers. More pics you can find here. Cand natura isi arata toata forta (copacii aceia sunt ireali)! Asa este! Nu credeam ca poate fi adevarat. 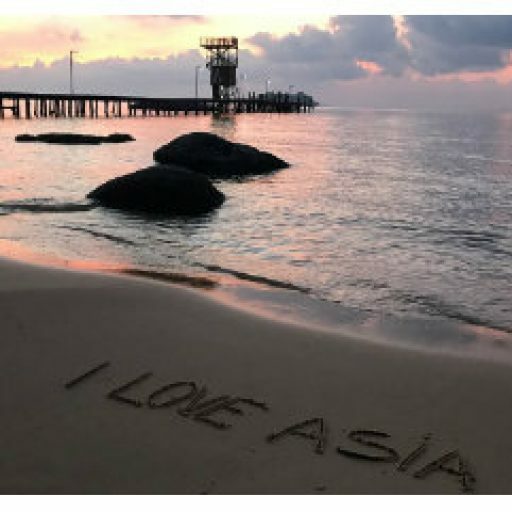 Cambodia and it`s beautiful beaches | About various things! Kampong Phluk-Cambodian floating village | About various things! 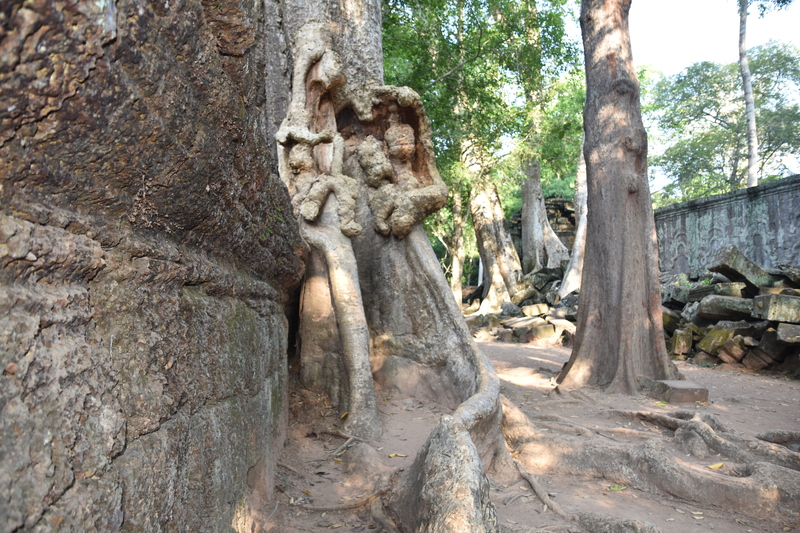 The trees and tree trunk “carvings” look amazing. I noticed there aren’t that many railings for seniors to hold on to. The steps look very steep. Is it difficult to climb up and go down? Dory, everything was safe! For few temples it`s difficult to climb up and go down, but other are very safe. Thanks Mirela I will train for my trip in Oct. May I know the more accessible temples? I want to visit these first.